Jayhawks And Tigers: A Sports Rivalry Born Of Blood : The Two-Way Enmity between the universities of Missouri and Kansas dates back to a massacre that occurred 150 years ago today. That's still not a good reason to commemorate the killings at a sports bar. Would you go to a bar to celebrate a massacre? That's a choice people in Kansas City are facing. Wednesday marks the 150th anniversary of Quantrill's Raid, a notorious killing and burning spree in Lawrence, Kan., the present-day home of the University of Kansas. 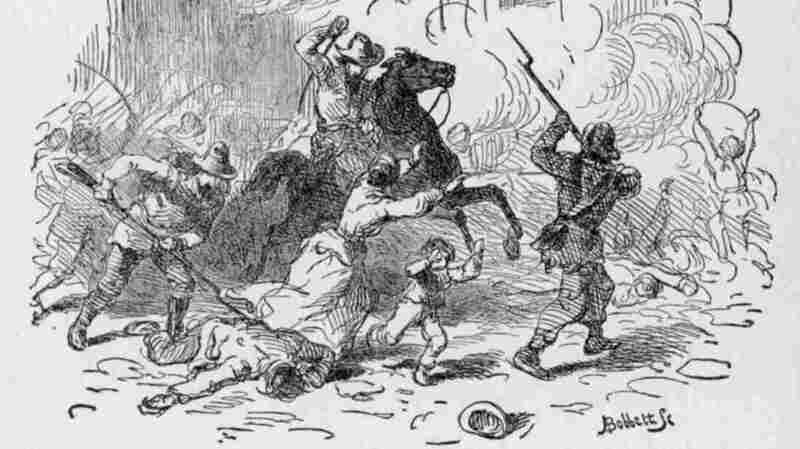 It was the worst atrocity in a decade's worth of Kansas-Missouri border fighting between abolitionists and pro-slavery forces. The Black & Gold Tavern, a Kansas City bar that supports University of Missouri sports teams, is holding a party in honor of William Quantrill's guerrilla attack and what its Facebook page calls "Missouri's most decisive road victory." "The border war between Missouri and Kansas essentially gave birth to a great rivalry between Mizzou and KU," says bar owner Zack Cartwright. "If you look at it strictly as a sports rivalry, then Quantrill is our guy, because he raided Lawrence." People in Lawrence don't look at it strictly as a sports rivalry. Some residents are descendants of the roughly 180 men and boys killed on Aug. 21, 1863. "Certainly, we remember the terrible tragedy in which about a fifth of the male population was killed," says Katie Armitage, author of Lawrence: Survivors of Quantrill's Raid. On Sunday, about 800 people showed up at Lawrence's South Park to hear speeches and a reading of the names of people who died. Commemorations are continuing with talks, museum exhibits and a Twitter reenactment. The Kansans would appear to hold the moral high ground, since Lawrence was an abolitionist stronghold. But while Americans have no difficulty memorializing battlefields such as Gettysburg and Pearl Harbor, they are queasy about acknowledging guerilla warfare because it's "so personal and vengeful," says Chris Post, a geography professor at Kent State University-Stark who has studied Lawrence's memorial traditions. "It's hard to take pride in, and it's hard to face up to when it's part of your heritage," he says. People in Kansas recognize that blood is on their ancestors' hands, as well. President Harry Truman's Missouri grandmother complained that Kansas Jayhawkers, as abolitionist guerillas were called, had plundered her farm. Several western Missouri counties are gearing up to honor the 150th anniversary on Sunday of General Order No. 11, the Union army's forced evacuation of those areas, which harbored Quantrill and other raiders, known as bushwackers. The order led to the displacement of as many as 25,000 people. "This was a two-sided affair," says Lawrence Mayor Mike Dever. "Missouri has its share of wounds and scars to heal, as well." Dever dismisses the Black & Gold Tavern's party as a publicity stunt, but argues that "to make a joke of it is bad taste, that's all." Missourians wouldn't much like it if a bar in Kansas celebrated the 1861 burning of Osceola. But Cartwright says his party, which will feature a talk by a descendant of Missourians burned off their land, is no more offensive than the University of Kansas mascot, the Jayhawk. "As far as I'm concerned, by celebrating their Jayhawker heritage through the naming of their athletic teams, they are rubbing salt in the wounds of all the Missourians who suffered at the hands of the Jayhawkers," he says. It's worth remembering that the University of Missouri mascot, the Tiger, was named not after the furry animal, but the militia that guarded the college town of Columbia. During 19th-century games between the KU and Mizzou football teams, fights broke out in the crowd between Union and Confederate veterans. As recently as 2007, Missouri students made up game day T-shirts that featured Quantrill's visage and an image of Lawrence set on fire. Jayhawks have responded in kind to such taunts. For years, a former football coach named Don Fambrough would deliver a locker-room speech before the Missouri game to fire up the KU team. Edward Leslie, the author of The Devil Knows How to Ride: The True Story of William Clarke Quantrill and His Confederate Raiders, takes issue with that characterization. "The last thing he told them before they went into town was that they were not supposed to hurt women," he says. But the violence did get out of hand. The people of Lawrence had recently been berry-picking and had made the fruit into wine. "The town was filled with wine and beer, and a lot of them went crazy," Leslie recalls. "Quantrill apologized to the Kansans for what his people were doing, saying they had gotten drunk and he had lost control of them." All the more reason, perhaps, not to mark the occasion at a bar.